Among the virtues of the classical guitar, its versatility as an instrument of accompaniment must rank high. It reaches its zenith when partnered with the female human voice. Some famous guitarists have also been competent exponents of wind instruments: Mauro Giuliani (1781-1829) played the flute and wrote some delightful music for guitar and flute duo. It is not surprising that he did not write music for guitar and saxophone, since the latter was not patented until 1846. Within the jazz genre, electric guitar/saxophone duos are not uncommon but the classical guitar appears infrequently in this combination. Combining the classical guitar and saxophone in duo may not be perceived by some as a union made in heaven, but the same could be postulated of other guitar/wind combinations e.g. classical guitar/pan flute. A review of Erato 4509.96022-2, featuring Alexandre LaGoya and Simion Stanciu Syrinx (pan flute) will quickly dispel any mooted incongruity. The review disc featuring a classical guitar and soprano saxophone duo is the first this writer has encountered. The Ryoanji duo comprising guitarist Robert Nathanson and saxophonist Frank Bongiorno is very active and records for the Liscio label; inevitably there will also be other recordings of classical guitar/saxophone. To facilitate developing familiarity and empathy with this rather uncommon combination of instruments, one may anticipate at least one or two familiar pieces within the review programme, but none appear. It may be by specific design that no well-known standards are included in the programme. Post-Baroque, most composers wrote with specific instruments in mind and for instruments such as the saxophone; transcriptions rarely work well. Although Bachianas Brasileiras No. 5 by Villa-Lobos has been arranged for guitar and saxophone, the latter’s difficulty in producing smooth legato dynamics does not do it justice. Fauré’s Pelleas et Melisande, originally for piano and cello, suffers a similar fate. Arrangements do appear on the review disc, but they have been very carefully chosen to complement the instruments utilised. Australian born guitarist Craig Ogden studied guitar from the age of seven and percussion from the age of thirteen. On completion of his music degree from the University of West Australia, he attended the Royal Northern College of Music where he earned the Music Professional Performance Diploma with distinction. Awarded to him in December 2004, he is the youngest instrumentalist to have received the RNCM fellowship. Gerard McChrystal comes from Derry, N. Ireland. Having taken up the saxophone at age seventeen, he subsequently studied at the RNCM in Manchester, London’s Guildhall School of Music and Northwestern University, Chicago. It was at the RNCM that he first met Craig Ogden. Their careers took them on separate musical paths until a chance meeting in 2003 at Trinity College of Music in London inspired them to form a duo. The programme features music from Ireland, Australia, U.K. and Germany, and incorporates folk, jazz and contemporary styles. * Many classically trained musicians attempt the crossover between classic and jazz/folk music, some more successfully than others. Certainly within jazz, classical guitarist John Williams was not successful. There are recorded examples of classical guitarists who suffered a similar fate. Impeccable as the guitar playing of Craig Ogden may be, musically it does not embrace the freedom necessary to do justice to some of the programmed items. 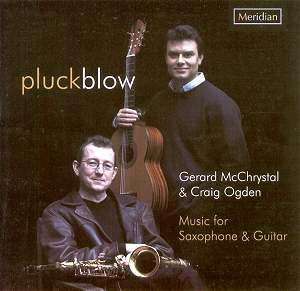 This is made more conspicuous by the soprano saxophone playing of Gerard McChrystal whose style places him at home in all genres. Sonically the review recording is a delight, and the squeakiest-clean disc I recall having heard; concentrated attention is required to hear even the faintest of finger movements on the bass strings of the guitar. It is challenging to define a target audience for this disc and predict who will enjoy it most. This is a dilemma faced with much crossover music, especially if it is a rather unusual combination of instruments and falls outside the raw elements of the genre. I enjoyed this disc and aside from minor criticisms found it has much to offer; those with similar eclectic tastes may constitute the audience that will also experience the same reactions. When Gerard McChrystal paid a vist to Dublin’s Contemporary Music Centre in search of repertory for this disc he heard a new piece by local composer Ciaran Farrell. The Shannon Suite is named after Ireland’s longest river and each movement represents a lake to be found on that river. Born in Melbourne, Australia in 1966, Stuart Greenbaum completed three degrees in composition at the University of Melbourne and is currently Lecturer in Composition at that institution. His music evokes an atmosphere set apart from the routine of modern life. Greenbaum describes Cloud Eight, among other things as ‘an opportunity to think again’. This version was especially adapted for McChrystal and Ogden who premiered it on 14 October 2005 at the Royal Welsh College of Music and Drama, Cardiff. Andy Scott was a contemporary of Gerard and Craig at the RNCM. He is a member of the Apollo Saxophone Quartet. The Nemesis series originally written for soprano sax and vibraphone has been arranged for the guitar and soprano sax. Greg Caffrey was born in Belfast. He completed his Ph.D. in composition as part of a musical education at Queen’s University, Belfast. He is Senior Lecturer in Music, Music Technology and Performing Arts at Bangor College in Northern Ireland. Pluck, Blow was first performed at Marden House, Calne, Witshire in February 2004.
fast-moving and charged with energy. Tony Davis is a composer from Wakefield, England and was specially commissioned to write the work Incantation. A crossover saxophonist, Davis has long been exploring the world of classical and jazz music through his compositions into Chamber-Jazz. The wind orchestra piece Incantation and Dance by John Barnes Chance has had a strong influence on the musical tastes of Davis since he first encountered it in the late 1970s. Billy Cowie, a Scottish composer, has released 12 CDs of his music on the Divas Record label. Originally composed for piano and saxophone in 1977, these three short romances are presented here as new versions for guitar and soprano saxophone. Ian Wilson comes from Belfast, and is one of the most original and successful composes in Ireland. Tern/Icarus comprises two settings of poems by Scot John Burnside from his collection The Light Trap. A German composer, Schultheiss is well known by European saxophonists for his funky work Witchunt. The composition No Rest took a long time to realise. Contributions by an oboist were abandoned and later supplanted by the recommendations of a Canadian saxophonist friend of the composer. A subsequent idea to rewrite it for duo was embraced.